Most bars in the United States are about 42 inches high. Typically you would like about 12 inches of clearance for your legs. Most bars, restaurants, and service counters use 30 inch bar stools. Most restaurant tables are about 30 inches high. With the same 12 inch rule, you would want your chair to have a seat height of about 18 inches. All chairs on our site have seat heights of about 18 inches. Our 24 inch bar stool is the perfect height for kitchen counters, playing guitar, bedrooms, basements, and garages. We also carry a line of fixed mounted counter stools which we can make in any height between 18 inches and 30 inches. Many people refer to these counter stools as soda fountain stools. This is the perfect item for counters that are not quite a standard height. We do not carry any products above 30 inches in seat height. Bar Stools and Chairs shows a large vinyl selection online. Click here to see our online upholstery swatches. Hopefully, you can find one that you like within our standard vinyl lines. We carry popular upholstery vinyl patterns like Cracked Ice and Naugahyde Zodiac. If you would like us to mail you a swatch, please follow this link. There is no charge for swatches. Computer monitors don't always display the upholstery vinyl swatches accurately. We want to make sure that you get exactly what you want. We have access to thousands more vinyl patterns if you don't find what you like. All upholstery work is done locally so if you think it can be done with a sewing machine and a pair of scissors, we can probably do it. We can mix and match colors to create very unique looks. Many chairs that we carry offer several different seat finishing options. On the diner chairs we offer a 1 inch pulled seat, a 2 inch box seat, and a 2 inch waterfall seat. The 1 inch pulled seat is made of one piece of vinyl and pulled directly over the foam. The 2 inch seat is made of several parts. Each different piece of vinyl can be a different color or the same color. The box seat has piping go all the way around the top of the seat. The piping on a waterfall seat finish goes around the back and then comes over the top like a waterfall and gets tucked under the front of the seat. 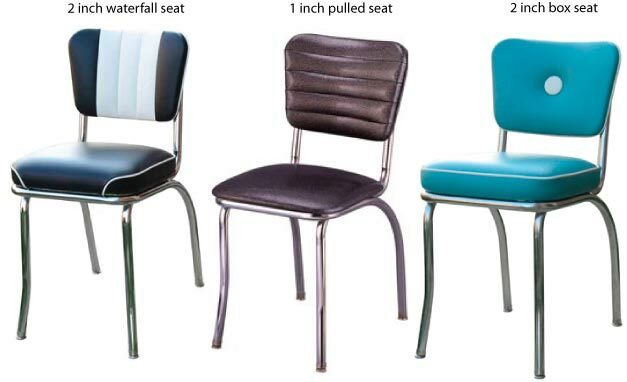 All of these options are available on our diner chairs. Channeling is an upholstery finish that looks great on many of our chairs and counter stools. Channel backs are created by sewing the upholstery into sections or channels. The sewing is done on the back of the vinyl, so all you see is the decorative channeling. Channeling can go either horizontally or vertically. Some of our diner chairs offer two tone channeling. For our two tone channeled diner chairs, you will need to select the color of the inside channels as well as the main color of the diner chair. You may select any color for the two tone channeling including the main color of your diner chair. Other companies limit your channeling options. We don't. We can sew channeling into any of our upholstery vinyls. Many of our items come with hand upholstered button tufting. Each upholstery button is made by hand with your order in the custom upholstery vinyl of your choice. It is a time consuming process but it is the only way to allow you an unlimited color selection. Each button is attached to the chair by hand using a soft rubber mallet to avoid scuffing. It is the little things like this that make our chairs the best. Piping is a small piece of material used to accent chairs and bar stools. It is typically used along seams. It looks great and does a wonderful job of hiding upholstery seams. Our piping is made of a small strip of upholstery vinyl wrapped around a flexible nylon cord. All piping is made at the factory after you place an order. We can make piping out of any upholstery material. Most of our diner chairs allow you to choose the piping color. If you would like to change the piping on an item that does not offer that option, just ask. We can probably do it. The arrows show where piping goes on a few different seat finishes. Several of our chairs and stools offer the ability to add a V-Back insert. The V-Back is a style of upholstery that sews different color vinyl together to form a V. Typically piping is added between the different upholstery colors to hide the seam. V-Backs can be done in any color including the main color of the back. Many of the frames we carry can be finished in black, brass, or chrome. Each item shows the available finishes in the drop down menu. If no choices are available, it is possible to alter the frame finish for large orders. A few of our bar stools have metal used to support the seat and back on the upper half of the stool. Some of these bar stools have a choice in finish. The table laminates that we use on our retro chrome tables are manufactured by either WilsonArt or Formica. We like to stick with the best. High Pressure laminates are ideal for table tops because they are extremely durable, don't buckle, and scratch resistant. Many home owners use Formica higher pressure laminates for their counter tops. We show about 15 of the most popular high pressure laminates. In addition to what we show on our site, we can get pretty much any pattern show on WilsonArt.com and Formica.com. If you need a custom quote, please just send us an email or give us a call. The soda fountain stools shown on our site are the best available. They are made by hand in the United States using mostly steel and cast iron. Soda fountain stools are available in any height between 18 inches and 30 inches. All of our soda fountain stools have the option of adding a cast aluminum footrest. Our footrest goes around the entire base for added strength. Aluminum matches well with chrome. The bell is the bottom part of the soda fountain stool that touches the ground. It is available in brass, black, and chrome. Under the bell cover is a cast iron bell which gives the stool its real strength. The Column of the stool is the piece between the bottom bell and the swivel which is right under the seat. We offer the column in chrome, brass, and black finishes. Back posts are the metal pieces that attach the back to the seat on certain soda fountain stools. They can be finished in aluminum, brass, or black. Aluminum looks great with a chrome base. All of the Soda Fountain Stools are meant to be permanently mounted to the floor. We offer three different types of floor attachments depending on your floor type. If you are unsure which one to choose, please contact us. Please make sure to tell us about your floor and what is below. There are three types of attachments available for the soda fountain stools sold at Bar Stools and Chairs. All orders must specify which type of attachment is required for your install. In order to install a Bar Stools and Chairs’ counter stool, you must have a model # WR100 counter stool wrench. We include this wrench free of charge with all soda fountain stool orders. The type A attachment will work on any wood floor. Type A consists of a 4x4 inch heavy floor plate that screws into the wood floor. The plate is attached to a 4 inch bolt that is used to attach the stool base to the floor. The type B attachment will work only on a wood floor that is above a basement. Type B uses a toggle bolt to hold itself to the floor. The counter stool base can then be attached to the toggle bolt. The type C is the most common type of attachment and used for concrete floors. In order to attach type C to the cement floor you must drill a hole 4 inch deep and 1 inch in diameter with a star drill. Place bolt in hole and use Por-Rok quick drying cement to secure bolt to concrete. Refer to instruction in package of Por-Rok for drying time.